Sami Ullah, the renowned civil engineer, presents this useful video tutorial in civil engineering youtube channel. In this video, the detail process is given for finding out the quantity of steel as well as shape codes for the steel bars. Shape codes are considered as the basis of a proper bar bending schedule. While going to estimate the reinforcement detailing for various members concerning a building, small bent ups and other angle detailing should be considered in the calculation to produce valid and cost-effective bar bending schedule. It will significantly reduce the cost and wastage of reinforcement. In beams & slabs there exist various bent ups, cuttings, and development lengths. Each and every bend and angle presented in the member is the outcome of design calculation. Therefore, these should be carefully enforced in practice. For small projects, it is unnecessary to compute these details, just include a few more inches and work out the Bar Bending Schedule. 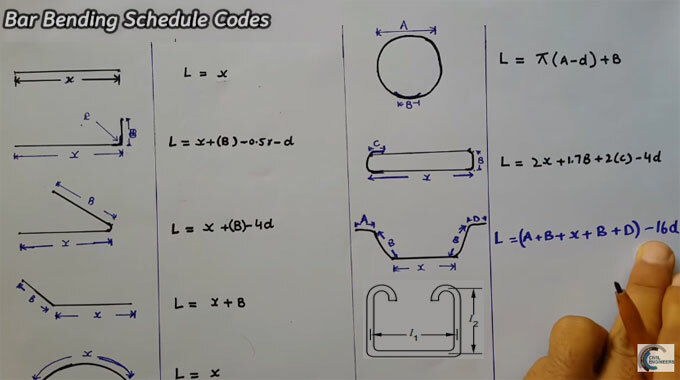 Go through the following video tutorial to be familiar with different types of shape codes.